Amidst a chain of endless cascading vibrations, our world is filled with countless dawns. From this radiant cradle, a torrent of sound flows forth with great force into the unknown future. 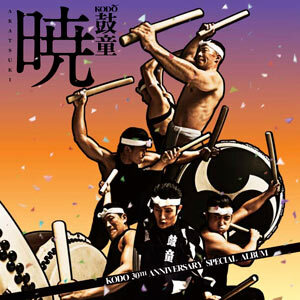 It has been five years since our best-of album Heartbeat Best of Kodo 25th Anniversary hit the shelves and six years since our last all-original album prism rhythm was released. So this year we are extremely excited to put out a brand new album that captures the spirit of the group today and is sure to become a defining recording for Kodo in the next generation. Recorded at Kodo Village, this 11-track disc includes brand new compositions as well as never-before-recorded stage pieces. Our favorite songs, polished in performance on countless stages worldwide, have been given new life through special arrangements that are only possible in a recording setting. Some new music was composed especially for this album, while other songs were born of collaboration with other artists. A few of the tracks showcase the captivating vocals of our female performers, while all eleven highlight Kodo’s broad range of expression and individuality.